I LOVE my baby sling (It's a Moby Wrap), BUT it is very hot here just now, and I haven't been able to talk myself into being wrapped in all that excess fabric. So I've been looking for something more simple with less bulk. 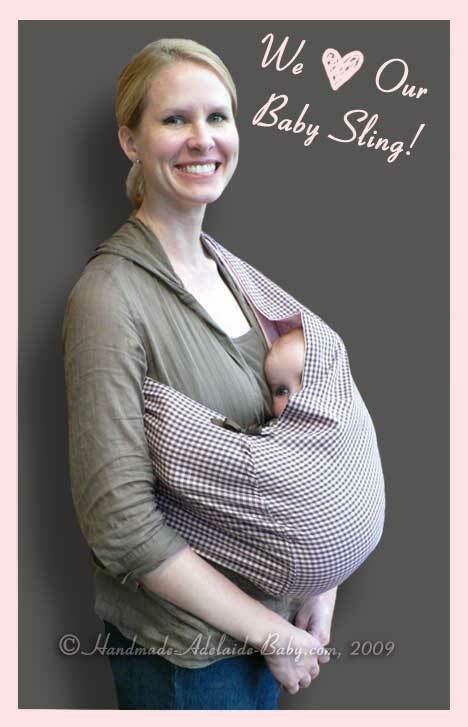 Well, today I found a great baby sling pattern tutorial, and I'm thinking I'd like to make one of these simple slings for my new baby! Doesn't that look easy? I'm getting excited about all the fabric combinations I can try out. Wouldn't this also make a fantastic baby shower gift? FUN!!! Toast the muffins. 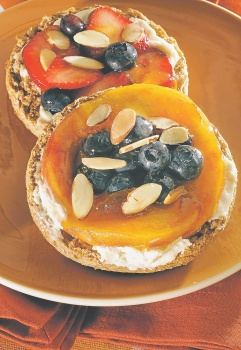 Spread cream cheese on each muffin. Thinly slice the fruit into bite-sized pieces. Top each muffin with fruit and nuts, if desired. 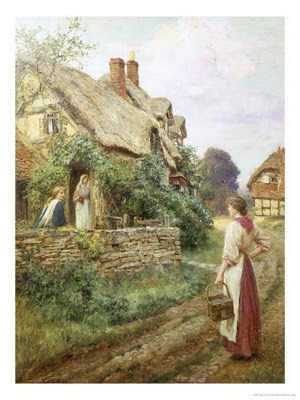 I know that it's Monday, and so I usually blog about marriage today, but I just wanted to take a moment to say thank you to those of you who glean something-- even a very little something-- from the Old Fashioned Motherhood blog. I've been blogging on this subject since 2005, (formerly hosted on Wordpress), and though I am not a great writer, or have anything truly earth-shattering to say, I do feel passionately about getting myself-- and in the process, helping other women-- back to our roots as feminine women and nurturing mothers. 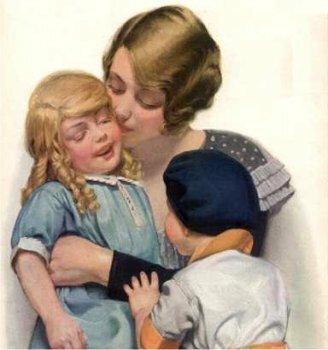 In my mind's eye, I see us all sitting in a parlor or standing out on our front porches, talking, laughing, and crying about the challenges and joys of motherhood and homemaking. I picture us exchanging recipes and bouncing babes in arms. I imagine us all hugging the friend who has had a bad day, or encouraging the young, busy mom who feels overwhelmed by the demands of caring for little ones. I hear us gushing over someone's new apron or haircut. I am so grateful that the world was blessed with the gift of Andrea Bocelli's voice! I want to live like this with the sun on my face, and I sing happily, gracefully. I want to live like this, with the air of the mountains, because this enchantment doesn't cost anything. I would like to acknowledge upfront that I am a VERY spoiled homemaker. I have two daughters, ages 16 and 11, who love to bake and cook. We are so blessed by their talents! These wonderful daughters of mine found today's recipe in a magazine, and have turned the baking of these wonderful little muffins into an art! Whenever they bring these warm and sweet muffins to the breakfast table, sighs of ecstasy flow forth... Mmmmmmm! Pre-heat oven to 375 degrees. Butter the bottoms only of standard size muffin tins and set aside. (I like to use cupcake papers for easier clean-up.) Measure the flour, sugar, baking powder, salt and nutmeg into a large mixing bowl and combine with a whisk. In another bowl, beat the eggs until frothy. Blend in the milk, melted butter, and vanilla. Make a well in the dry ingredients and pour in the liquid mixture. Using a wooden spoon, mix the batter just until it's evenly blended, then spoon it into muffin tins. Bake on the center rack for 15 minutes. Then transfer the pan to a wire rack until muffins are cool enough to handle. Before muffins lose their warmth, prepare the topping.--> Mix the sugar and cinnamon in a small bowl. Melt butter in a separate bowl. Dip the tops of the muffins in butter and then the cinnamon-sugar mixture. Serve immediately.